On a better note, Jane performed beautifully through out the weekend inspite of the set back of breaking her gearbox. Kian and Boy from Chikian workshop did a wonderful job of replacing the gearbox and had her going for the next day of the competition. Jane had qualified 21st which places her into the best 32!! Though having an early exit out of best 32, her run against Iranian Drifter , Shah in his 400bhp 180sx was a close one!! Only a uncharacteristic spin during her turn to lead had given the win away!! 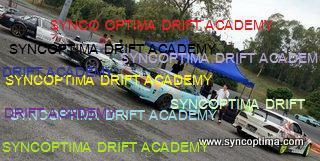 This entry was posted in Goodyear, Posting by Ariff, Sync Optima Events on May 18, 2011 by skagee.